I will never be lost, the seed which was sown from the ancient home of Rangiātea. Keynote speaker at the national Oranga Tamariki hui, Horiana Irwin-Easthope, made all of us think when she said “They tried to bury us. They didn’t know we were seeds”. It was a wonderful moment to pause, and to think abou the positive growth of new generations; flourishing from a collective determination to survive. The phrase apparently came from a Mexican movement, the Zapatista. But when you dig further, it can be traced back to a Greek poet Dinos Christianopoulos, a voice of the homosexual community. The meaning is clear. No matter what barriers or obstacles encountered – policy; legislation; institutional racism, economic restraints – the lifeforce of a people can not be squashed. The legacy of past generations continues to sustain new life; to create the optimum conditions to thrive. Horiana was speaking at the national hui about Section 7aa – the new provisions in the Oranga Tamariki Act. Section 7aa makes it explicit that the department seeks to develop strategic partnerships with iwi and Māori organisations, including iwi authorities, in order to provide opportunities to, and invite innovative proposals from, those organisations to improve outcomes for Māori children, young persons, and their whānau who come to the attention of the department. The hui had been called to promote and discuss ideas and opportunities for iwi and Maori organisations to work in partnership with Oranga Tamariki, including the development of strategic partnerships. Te Pūtahitanga o Te Waipounamu was asked to attend, to present about the work we are doing with Mokopuna Ora, and the appointment of a Whānau Ora Navigator working in Oranga Tamariki (Mamaeroa Ngata-Stephens) and the Iwi Relationship Manager (Michelle Turrall). The Otautahi contigent attending he Hui: Moira Underdown, Mamaeroa Ngata-Stevens, Michelle Turrall, Amber Clarke. Congratulations to Cazna Luke and Maania Farrar for graduating in the Rise2025 coaching and leadership programme for 100,000 Indigenous Women. This is an international coaching, leadership and mentoring programme for Indigenous women. Last Saturday 6 October, Murihiku Pounamu opened up the doors to the South, hosting a workshop in Gore. The opportunity was to learn about the history and geology of pounamu with local pounamu artist Gavin Thomson. It provided a chance to learn about the different types and where it comes from and how it is formed. Whilst sanding their very own pounamu toki, finished off with your own hand plaited cord., it was also a great opportunity to make connections, and find a new love for this taonga. Rongoā Māori is a traditional Māori healing approach to wellbeing encompassing karakia; purea; korero; spiritual and physical connection to the environment; rongoā rākau; and therapeutic bodywork (mirimiri; romiromi) or it can include a combination of all of the above. The search for complementary and alternative medicine has placed the global eye on rongoā practice to provide "cures" as the number of international consumers of rongoā services continue to increase. Coupled with this, disillusionment in the mainstream health services is driving the public to seek natural alternatives. KOHA (Kia Ora Hands Aotearoa Ltd) was established to specialise in rongoā Māori and mirimiri services and incorporate safe practices to ensure a delivery of quality rongoā Māori care during the provision of services to tūroro. This week we were delighted to launch a digital story, promoting their amazing work. Jade Maguire is a man with a passion for plants and people. 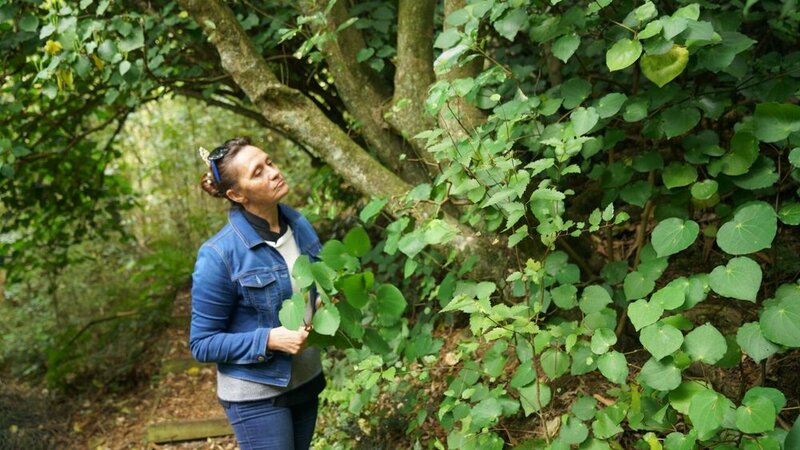 Based at Te Takutai o te Tītī Marae in Colac Bay, he’s started an initiative to provide an eco-learning space, with the aim to teach the community skills to recover our natural environment and improve their own health. As part of his Te Whakaoraka initiative, he’s set up a native nursery where he works with the community to grow thousands of plants each year, which are then used in local restoration projects. Jade is a nominee in the Southland Community Environment Awards. Congratulations Jade! This photo was taken at the 125th Suffrage Year celebrations at Christchurch Women’s Prison, with Corrections staff from across the Canterbury prisons. Coming up on Sunday 21st October, the Canterbury Men’s Centre is planning a coffee event in central city Christchurch. The plan is to give people a free coffee in exchange for them writing a short message about a positive male role model, or another man in their lives they are grateful for. We would like to hear about your care experience of supporting a friend or whānau member who may have a disability, health condition, or illness with their everyday living. Your views will help the Government to develop the next Carers’ Strategy Action Plan, which aims to better support carers to have improved wellbeing and long-term outcomes.